Every winter in Thunder Bay, the waterfront area becomes dotted with large blocks of snow. Over the course of a few days, artists work to turn these cubes into intricate and detailed sculptures. 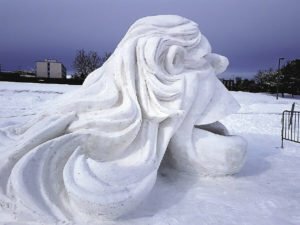 Snow sculpting is an impressive art form that shows how even the most simple and commonplace materials can be used to create stunning works of art. 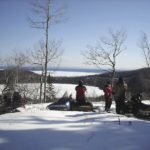 Snow sculpting events occur throughout the Northern Wilds, with festivals in Two Harbors and Ely, as well as Thunder Bay. Michael O’Connor is a snow sculptor from Thunder Bay who got started after a trip to Grand Marais. Chad Kirvan is another snow carver from Thunder Bay. Like O’Connor, he is also a professional sculptor. After studying sculpture in Toronto he moved to Thunder Bay, and it was there that he decided to try snow sculpting. “I started snow sculpting about three years ago,” Kirvan said. “Some friends and I decided to try it. There’s definitely a learning curve, but our first try wasn’t terrible.” Since starting, Kirvan has sculpted every year in Thunder Bay and has also participated in the Ely festival. To begin a snow sculpture, each carver starts out with a large block of snow, typically 8’ by 8’ but sometimes larger. A team of a few carvers will work together on a block over the course of a few days until it’s transformed into their design. O’Connor recalls strategizing during a warm year by carving overnight. The judging was to occur in the morning, so while other sculptors had added detail during the day and had it melt, he waited until night when the temperatures dipped below freezing to add the detail to his sculpture. His working through the night paid off: the detail was there for the morning judging, and his team ended up winning. A typical snow sculpting festival will have a theme around which the artists can structure their design. Another unique aspect of snow sculpting is the tools involved in the process. “A lot of people make their own tools just for snow sculpting, and it’s cool to see what people come up with,” said Kirvan. O’Connor is one who has made some of his own tools for snow sculpting, all of which have a hand-hewn wooden base. One is fixed with a roof truss nail plate, and another with old plexiglass sheet. “I do most of the roughing with a square steel spade and machete and hack away. Sometimes I use saws. 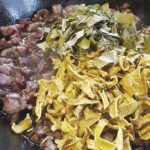 The handmade tools can be used to create texture.” Apart from handmade tools, typical tools seen during snow sculpting festivals include shovels, hand saws, wooden spoons, and machetes. 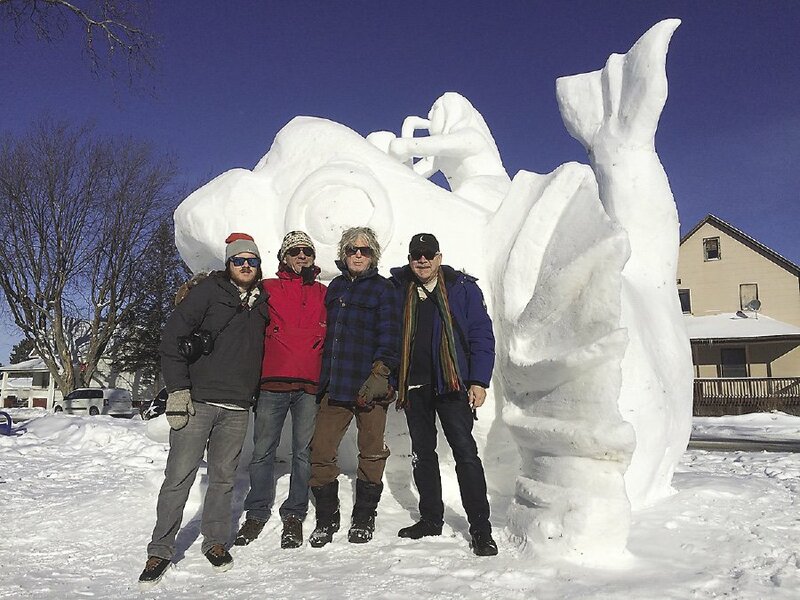 While the process of snow carving is an exciting challenge, both Kirvan and O’Connor said they both really enjoy the carving community and meeting people at festivals. “There’s definitely a community aspect where you see the same carvers every year, but there are also a lot of new faces, too,” said O’Connor. 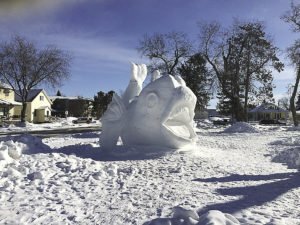 This month, there will be three different snow carving events in the Northland. Ely’s Snow Sculpting Symposium runs February 7-10 as part of Ely’s Winter Festival. 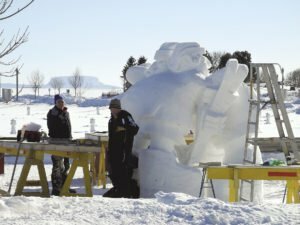 Snow sculptors have the option of carving 8’ blocks or 12’ blocks as part of this event. The event will take place in Whiteside Park and are lit at night by ice candles. Finally, Thunder Bay will host their annual snow sculpting competition as part of Family Day on Monday, Feb. 18. The theme for this year’s competition is transportation, and the event will take place at the waterfront. Visitors are free to stop by any of these events to observe the fun and see just how impressive snow can be.